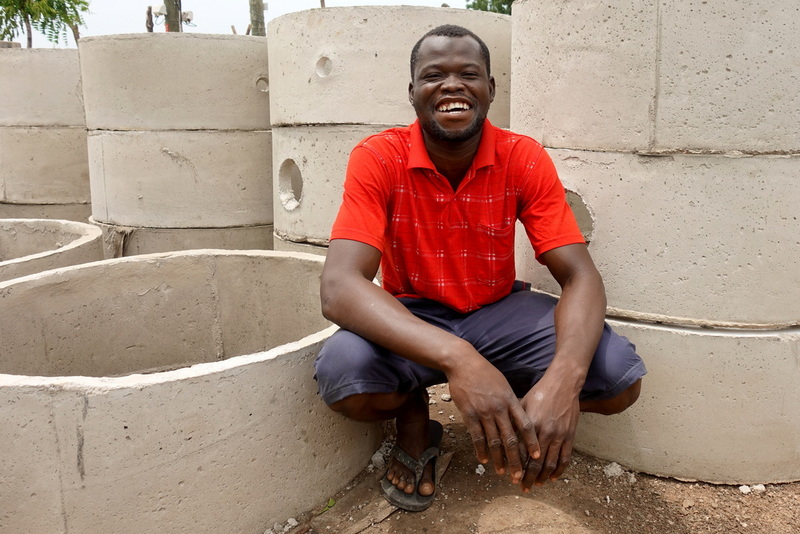 Everyone who becomes a Kiva borrower through iDE Ghana’s Sama Sama Toilet program wants to buy a toilet structure - the very first toilet to ever grace their home. Amazingly, 100% of these borrowers have gotten funded by Kiva lenders, a fantastic statistic! But have you ever given any thought to how the structure gets there? It isn’t magic, someone has to build it. The behind-the-scenes success of Sama Sama Toilet is its Toilet Business Owner program, or TBO. As the new-on-the-ground Kiva Fellow, I got to visit three TBOs today. 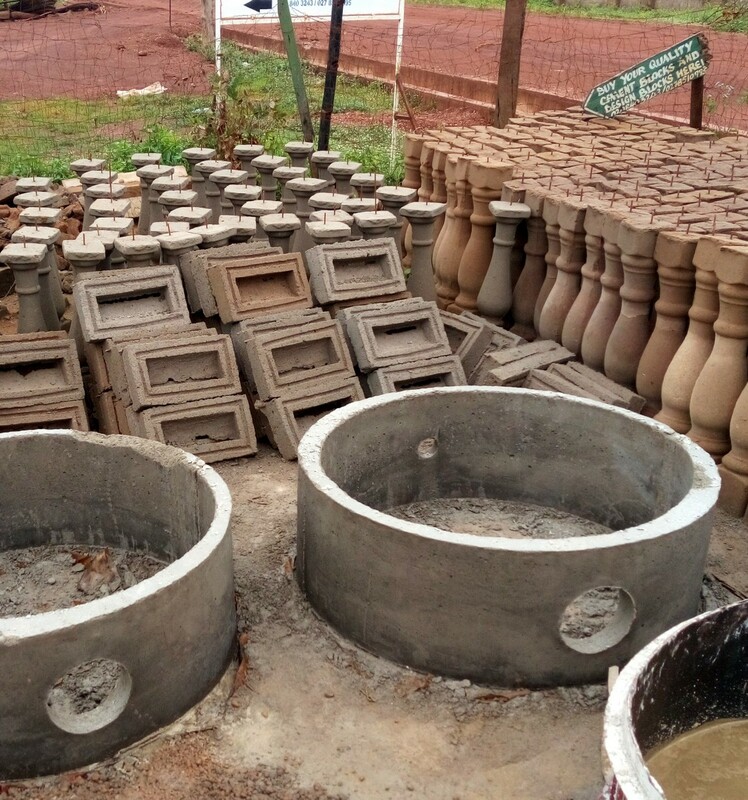 TBOs are recruited early on in the Sama Sama process, and usually already have an established business working with concrete. Case in point, all three I spent time with today also made concrete blocks, columns and posts. However, their main focus now was on building toilets. 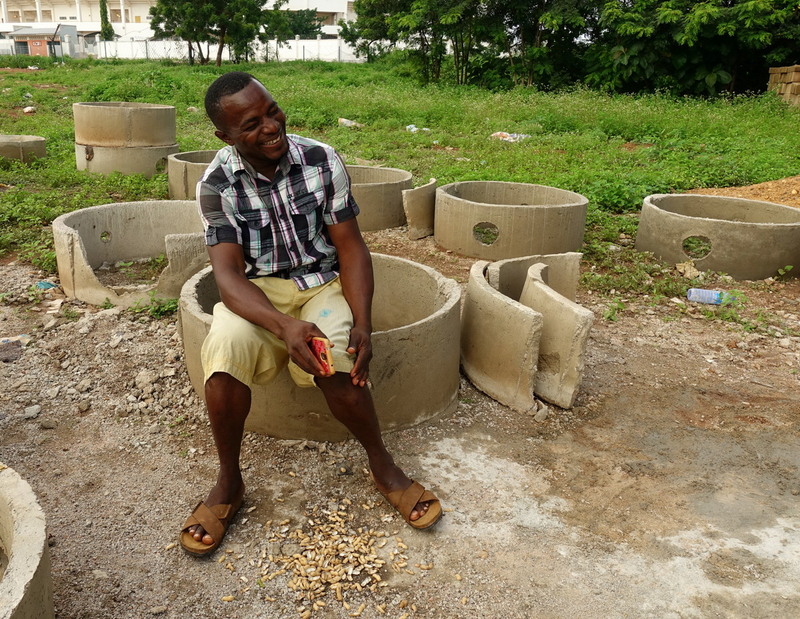 Ibrahim, the first TBO I visited, added Sama Sama toilets to his concrete business almost two years ago. He’s seen business and profits increase, so much so that he has hired 7 new employees! Not only that, Ibrahim has used profits to benefit his family as well, sending 2 of his 3 children to good private schools, the third one is going to have to wait – she is only 2 years old. The next toilet business owner we visited was Sumemi, whose father joined Sama Sama almost 3 years before. Sumemi started working on the toilets with his father shortly after that, and they have hired 12 employees so far, building between 60-80 toilets a month. Sumemi is eager to learn even more about sanitation and plumbing, he was all smiles when talking about the decrease in sickness he believes is due to fewer people openly defecating. I had expected to be wowed by the Kiva borrowers, their stories of how a toilet had improved their health, dignity and even time management. 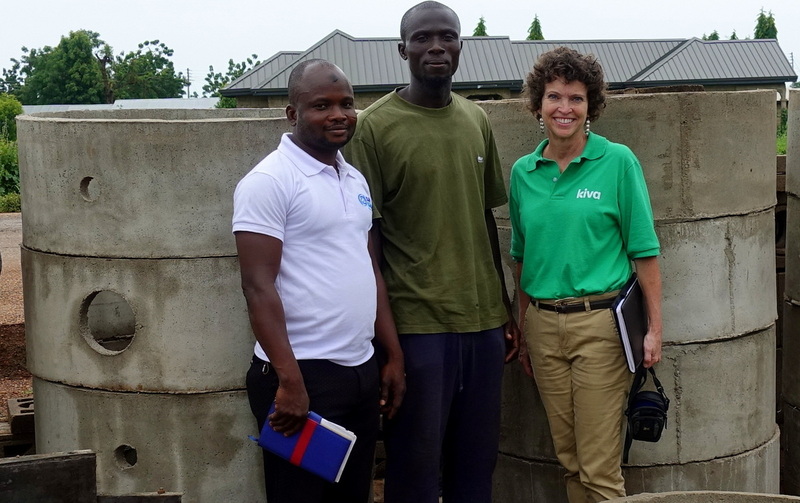 I hadn’t even considered the effect of Sama Sama on the TBO, and how critical the Kiva lenders are to creating jobs by supporting toilets in northern Ghana. An excellent learning experience and I am eager to see what other wonderful surprises the toilet business has in store! Click here to support iDE Ghana! Betsy worked for 21 years in sales with Pfizer Inc. In 2014 she was chosen as their Global Health Fellow to PSI in Cambodia for 4 months. 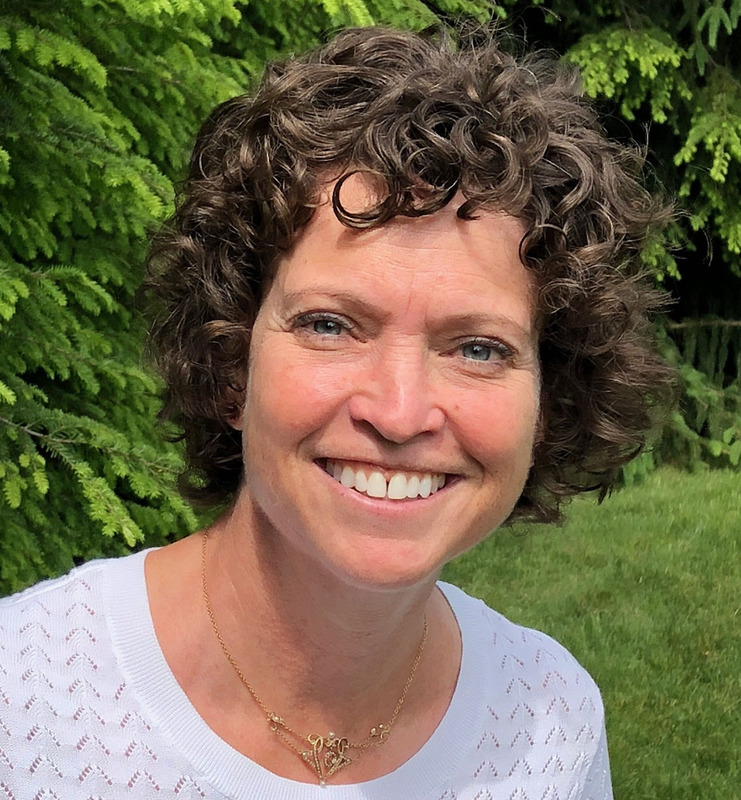 After working to enhance PSI/PSK's efficiencies and capabilities, she decided to work full-time helping others, leaving Pfizer to lead a US nonprofit which supported an NGO in Ghana. She saw the importance and benefit firsthand of empowerment versus charity, as they worked in rural villages on WASH and education infrastructure projects. Betsy is excited to continue learning how to empower others through the Kiva Fellowship. She is looking to increase her knowledge and abilities in order to create a microloan organization focusing on community and group loans that will be used to improve education, health and WASH infrastructure.